CIO.com's Al Sacco spent a week with the new BlackBerry Passport before its official release. Here are five things you'll likely love about the unique and innovative device, along with four more things you very likely won't. I was fortunate enough to spend some time with the Passport before the announcement. The device is unlike any smartphone I've seen before. It's big. It's square. It has actual buttons — a lot of them. It's kind of awkward. It's definitely not for everybody. That's all OK; the Passport is one of the most interesting and unique devices the company has ever made. Before getting into specifics, I want to specify that this story isn't a full-on Passport review or evaluation. As I sit on a flight from Boston to San Francisco, writing this post on my Passport, I've been using the device for less than a week, not nearly enough time to provide a complete evaluation of the hardware, software and all of the Passport's various features. Instead, this story is meant to tell you some things (good and bad) that you didn't know about the device and to fill you in on what the Passport is and who might be its ideal user. When I reviewed the BlackBerry Z10 in January 2013, I fell in love with its on-screen keyboard and associated predictive text system. It was completely unique, and it worked well. However, it's still a touch keypad, which can't match a physical keypad for rapid typing, at least not the way I type. As soon as the BlackBerry Q10 was available to me, the first BlackBerry 10 device with a "real," physical keypad, I relegated the Z10 to The Land of Misfit Tech Toys (a.k.a., my dusty bottom desk drawer), where it has quietly resided ever since. The Passport's combination of touch-enabled physical buttons and on-screen keys is refreshing in a world of cookie-cutter mobile keyboards. Most importantly, it can help you get more work done on your smartphone. The thought of typing out this post on my new iPhone 6 quite literally gives me chills. The job wasn't exactly enjoyable on the Passport, but it was better than whipping out my 15-inch laptop to write on the plane in my cramped economy seat. The Passport keyboard has a steep learning curve. Not everyone will want to spend the time necessary to master the system. (More on that later.) But the Passport keyboard is the most innovative keypad I've ever used, and I appreciate it more as I spend additional time with it. The BlackBerry Passport packs a big honking battery. Its capacity is 3,450 mAh, to be exact, and you get about 25 hours of "mixed use," according to BlackBerry. For context, the new iPhone 6 Plus reportedly has a 2,915 mAh battery, which gets you about 16 days of standby time, according to Apple, compared to the Passport's reported 18 days. Samsung's new Galaxy Note 4 has a 3,220 mAh battery. I turned on my fully-charged BlackBerry Passport (on AT&T) at 8 a.m. Monday in Boston just before the plane took off. I wrote non-stop for about three hours of my six-hour flight, while listening to music. I surfed the Web a bit when I got to San Francisco, performed other random tasks and took a bunch of pictures at the Oakland A's game that night. I streamed another baseball game for a while and responded to a number of messages. I purposely didn't charge my Passport at all. It still had 38 percent battery life as I edited this post on Tuesday, nearly 29 hours later. That's impressive. Unfortunately, the battery is fixed and can't easily be swapped out. This is disappointing; the majority of past BlackBerry phones had removable power packs, making this feature a staple of BlackBerry devices. 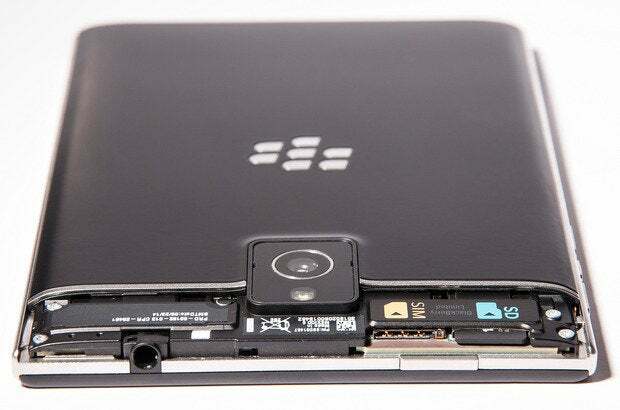 The BlackBerry Passport is a high-end device, which is evident in its design and build quality. BlackBerry's Director of Software Product Management, Michael Clewley, who gave me a breakdown of the device, says the internal steel structure of Toronto's TD Centre inspired its design; the Passport has a similar brushed stainless steel band that wraps around the entire outer edge of the phone. The band is a solid piece of steel, not a set of connected components. That lends a solid feeling to the handset. However, it's relevant and necessary to note that I did have a hardware issue with the first Passport device I received, and it was serious enough that I had to swap it out for another device. When I first removed my review unit from its packaging and tried to put on its case, the removable panel that covers the nano-SIM and memory card slots got caught and came off halfway. It wouldn't snap back into place, so I had to force it open. When I popped the cover back in place, my Passport went into a reboot loop, and it was stuck until I removed the cover again. If I replaced the cover, the device rebooted. After some experimentation, I determined that the cover was causing the power/wake/sleep button to stick and start the reboot loop. It wasn't a good start with the device, and I don't know if my trouble with the case was the cause of the problem, but I'm sure it didn't help. Either way, the Passport I'm using now feels very sturdy, and it's a great-looking smartphone, but I wouldn't be surprised if I'm not the only one who has issues with the power key. The BlackBerry Passport has a top-notch speakerphone. That's important because it's a phone, after all, and its 128 mm (L) x 90.3 mm (W) x 9.3 mm (D) size makes it awkward to hold up against your face in some cases, especially if you have tiny hands or a weirdly minute cranium. Two separate speaker ports are built into the base of the device, which helps amplify and direct sound. I use the speakerphones on a variety of different devices regularly for interviews, and the Passport's speakerphone is one of the loudest I've used. Clewley even suggests that it could replace a Polycom or other dedicated speakerphone in some cases. The Passport also uses a number of fancy-sounding audio technologies designed to improve and enhance call quality through the earpiece, but I haven't used the phone in that way enough to comment. I haven't tried the app yet, because BlackBerry didn't make it available to me along with my evaluation device. The company did give me an in-depth demonstration. Honestly, the software interface I saw looked functional but clunky and outdated. What BlackBerry Blend represents, though, is perhaps just as important as how well it looks and functions. The BlackBerry Passport is the first BlackBerry device in years that knows what it is and whom it's for. It isn't trying to be everything to everyone. BlackBerry is well aware that its target user also has a Mac and/or a PC, and probably an iPad or Android tablet. Blend aims to improve the interaction with all of your different devices and platforms. Clewley says Blend is also IT-friendly, because it can lower total cost of ownership per user and address BYOD concerns. Companies that issue corporate Passports can train users on Blend so they never have to connect personal devices to corporate networks, and IT only has to issue one Passport for secure access on a variety of different devices. The BlackBerry Passport has a clear identity, an apparent purpose, and it is a tangible sign of renewed focus at BlackBerry. There's a lot to appreciate about the BlackBerry Passport...but it does have some downsides.